This is a delicious breaded haddock recipe that's actually really healthy. Serve it with home-made potato wedges and a big salad for a filling dinner. Season the milk with the salt and pepper. Combine the parmesan, breadcrumbs, and dried thyme in a bowl. Dip the fish into the milk, and then press it firmly into the breadcrumb mixture, coating each side of the fish. 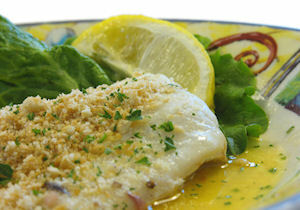 Place the haddock into a shallow oven dish and drizzle it with the melted butter. Cook the haddock for around 15 minutes or until it flakes. This recipe is a complete disaster. Basically, the breadcrumb mixture does not stick to the fish simply by having been dipped in milk. I had to improvise by placing a layer of the bread crumb mix in the dish, placing the milk-moistened fish on top, the cobering with more bread crumb. It is in the oven now, we will see what comes out. Average rating of 2.50 stars based on 2 reviews. Summary: This is a delicious breaded haddock recipe that's actually really healthy. Serve it with home-made potato wedges and a big salad for a filling dinner.